(Kalonymus ben Kalonymus). Masecheth Purim [Drunkards’ Talmud]. * With: (Tzvi Hirsch Sommerhausen). Hagadah LeLeil Shikurim [“Hagadah for the Night of Drunkards.”] * And: (J. L. Ben-Ze’ev). Selichoth LePurim [“Penitential prayers for Purim.”] * And: (Abraham Mendel Mohr). Kol Bo LePurim. ff. (16); (16). Stained. Modern boards. 8vo. Vinograd, Lemberg 1814. 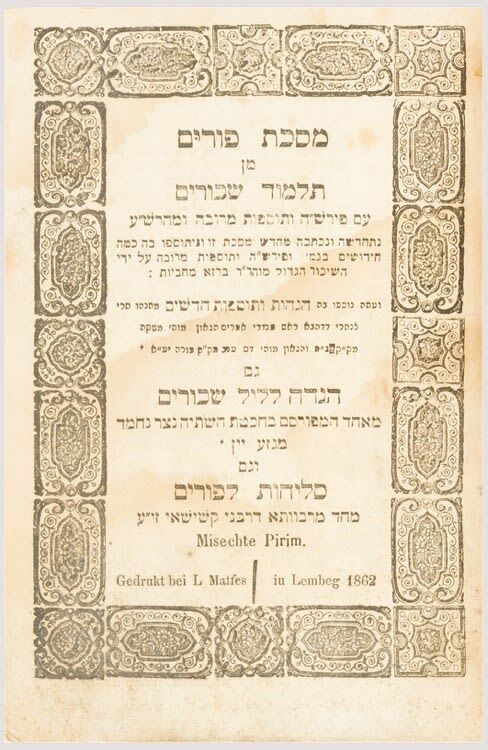 A satirical pamphlet written in the styles of the Babylonian Talmud, the Passover Hagadah and the penitential prayers for the Days of Awe. Masecheth Purim begins with a discussion as to which non-alcoholic drinks may be consumed on Purim in extenuating circumstances. The Leil Shikurim Hagadah retells the story of the five sages whose Purim feast lasted until dawn, while the Selichoth for Purim service ends with a rousing ‘Shethiya Gedolah’.